Mainly clear skies. Low 58F. Winds WNW at 5 to 10 mph.. Mainly clear skies. Low 58F. Winds WNW at 5 to 10 mph. Blessed are you who are poor, for yours is the kingdom of God” (Luke 6:20). More than a year has passed since I arrived at my new call as associate pastor at St. Paul Lutheran Church in Lodi. Currently, Lodi is about 40 percent Latinx, and my ministry focuses on outreach to the Spanish-speaking community. I have been blessed in ministering to the migrant community of California’s Central Valley. They have received me with open arms. Most of the migrant workers who have started to attend our worship service are from Mexico. Some are U.S. citizens, some are legal residents, and some are undocumented. Some are Dreamers, stuck in political limbo while eagerly waiting to become citizens. Many of our Spanish-speaking worshipers come from mixed-status families, which means some family members have immigration documents while others have documentation issues. Sadly, some members of U.S. society, including some of our political leaders, identify migrant workers as public enemy number one. The migrant families I know feel the weight of this hatred, disdain and rejection from people who’ve turned their struggle for a better life into a political issue. They are not an issue for pundits to ponder — they are our brothers and sisters. Migrant families in the Central Valley celebrate the gift of each moment. I am learning from them that faith and hope are not an intellectual exercise alone, devoid of emotion and life experiences. As I get to know more about the migrant community’s hopes, dreams and profound faith in God, I am also confronted with their suffering. These families endure difficult labor, low wages, the threat of deportation, and verbal and physical attacks. Many are not paid overtime and, to finish their work by the appointed hour, may not even take a bathroom break. Some undocumented female workers are targeted by men who feel they can take advantage of them due to their immigration status. I have heard many stories of sexual harassment from women who attend our worship service. When I preach to this community, I cannot simply fall back on a platitude such as “Everything will be OK.” My parishioners — who daily wrestle with hardship — have much to teach us about faith and hope. What does it mean to trust God in situations where your whole life can be turned upside-down in a second? Today the whole family may be under the same roof, but tomorrow a sibling or parent could be deported. Migrant families in Central Valley celebrate the gift of each moment. I am learning from them that faith and hope are not an intellectual exercise alone, devoid of emotion and life experiences. Our faithful migrant siblings are crucified by our economic system so that we might enjoy affordable produce. These blessed laborers pick the grapes that yield our communion wine every Sunday. Yet our society repeatedly denies them their worth and human dignity. For every undocumented immigrant who has committed a crime, I can show you hundreds who might teach us the meaning of faith in a loving God. They have much to show us about trust, community, endurance, gratitude and humility. My prayer for the year ahead is that this church might respond to the needs of our migrant siblings by making them not a political target but a target of our respect, love and gratitude. 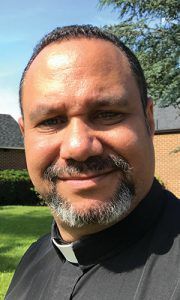 Nelson H. Rabell is a pastor of St. Paul Lutheran Church in Lodi.